Arrows In Opposite Direction Metaphor PowerPoint Templates And PowerPoint Themes 1012-Visually support your ideas with our above template which contains a graphic of two arrows pointing in opposite direction. It signifies the two opposite concepts. It can be used for comparison purposes. Add charm and personality to your presentations with our colorful template.-Arrows In Opposite Direction Metaphor PowerPoint Templates And PowerPoint Themes 1012-This PowerPoint template can be used for presentations relating to-"Opposite directions, arrows, business, signs, spheres, finance" Resolve problems with our Arrows In Opposite Direction Metaphor PowerPoint Templates And PowerPoint Themes 1012. Download without worries with our money back guaranteee. 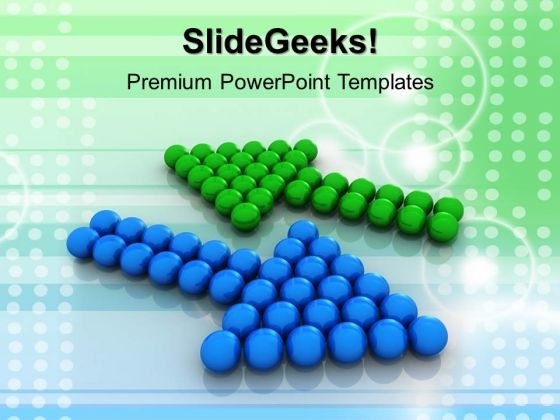 No end is too far for our Arrows In Opposite Direction Metaphor PowerPoint Templates And PowerPoint Themes 1012. They ensure your thoughts always arrive.